As a UN-brokered truce approached, tables were beginning to turn in Syria, with the government's Russian-backed offensive making major breakthroughs against rebel forces in Aleppo, Latakia, and elsewhere. Meanwhile, the so-called "Islamic State" (ISIS) continued to hold vast tracts of the country, while Kurdish-led forces gradually expanded their control in victories against ISIS and rebel fighters alike. 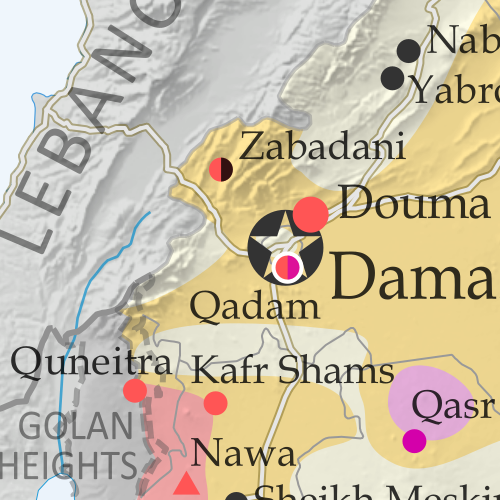 See all this and more on the newest update to PolGeoNow's concise, professional Syrian Civil War control map, which includes a timeline of changes since our previous Syria map report in mid-December. New in this edition: Terrain shading and major highways included on map for geographic context! Up-to-date map of current territorial control in Syria, color-coded for the Assad government, rebel groups, "Islamic State" (ISIS/ISIL) extremists, and Kurdish YPG forces. Locations of recent fighting and military operations, including Menagh airbase, Aleppo, Salma, Rabia, Nubl, Baghaliya, Tishrin Dam, and more. 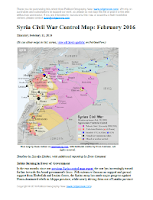 Detailed timeline of important events and changes to territorial control since December 9, 2015, compiled by our Syria-Iraq expert, with links to sources. Categories: al qaeda, asia, conflict zones, divided countries, isis, middle east, premium, rebel control, russia, syria, the "islamic state"